Ethel Nowell Andrews, of Shady Side, Maryland, retired in 1955 after teaching for 46 years. She passed away in October 1997 at the age of 108. 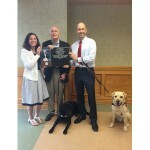 Curt Landtroop ‘73 received the 2015 President’s Leadership Award from Guiding Eyes for the Blind, a New York-based guide dog school. Students, recent grads spent their summer surrounded by books! Lynn Tomlinson’s film one of seven finalists in the animation category.